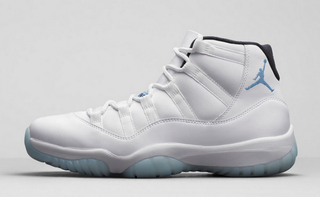 These new Air Jordan 11 Retro “Legend Blue” sneakers will be available for purchase on Dec. 20, 2014. The Air Jordans pictured above are being rereleased Saturday. That may mean nothing to you, but to hordes of young men and women who slept outside for the opportunity to win the golden ticket—à la Willy Wonka and the Chocolate Factory—to purchase them, it means the world. There is a running narrative that lines up next to these sneakerheads, who shell out hundreds of bucks to be the first to own a deadstock pair—or, in sneakerhead parlance, a pair of new, fresh-out-the-box, never-touched-the-floor sneakers—about how insane the entire tradition is. There are the tired tropes of some people believing that they should be doing something else with their time, and their money, than buying expensive sneakers. But here are three quick reasons why we have to rid ourselves of this idea that people who stand in lines for hours to cop limited-edition sneakers are making vapid purchases influenced by materialism. And let’s lose this upper-crust ideology that sneakerheads are somehow engaged in a superficial hobby. 1. The sneakers are art. It bothers me that I have to reference a hobby that is often associated with rich people in order to make the case for why we should stop snubbing our noses at sneakerheads. But I will: art. When Puff Daddy was eyeing Picasso’s Venus artwork at Art Basel like a vulture closing in on its prey, no one cared because rich people blow big cash on big things. It’s a given. Puffy can salivate over those pieces because, well, those items have a value and seriousness attached to them that sneakers don’t have. But the truth of the matter is, sneakers are art. They’ve moved past their mere purpose and are considered by many to be a legitimate canvas that designers and artists use to express themselves. They’re timeless and classic, and their value appreciates with age, just like art. Many of them embody a certain kind of archaic, bold, artistic expression that people love. People wear Air Jordans to convey a cool, urban lifestyle that they’re either currently living or hoping to lead. Simply put (and this isn’t a stretch): Jordans can be aspirational. Plus, unlike some of the scribble scrabble that masquerades as high-end art and gets sold for millions of dollars at auctions, a lot of Jordans are a unique blend of colors, designs and textures that achieve pure nirvana. Don’t believe me? Look at the energy that Tinker Hatfield puts into his creations. Who is Tinker Hatfield? Google him; I’ll wait. 2. Retail prices are the cheapest option. Look, Jordans are expensive. Insanely expensive, especially for the working-class communities that typically covet them. But one of the main reasons people stand outside for hours to purchase “limited edition” models is that only a certain number of them are sold in stores at the market price. So waking up at 3 a.m. to get to a Foot Locker makes not only sense (see point 1) for sneakerheads but also cents, since they’d rather pay $250 for the Air Jordan Doernbecher IV on day 1 than buy them for more than $1,300 on eBay from someone who’s flipping them for three times their original selling price. 3. The sneaker resale market is bookoo rich. According to recent estimates, the sneaker resale market is valued at approximately $1 billion. Yep, that’s billion with a “b.” Again, for those limited-edition releases, each store gets anywhere from a dozen to 100 pairs of shoes. So entrepreneurial sneakerheads—usually with their friends in tow—purchase them with the intent to sell them on eBay soon thereafter and, again, for much more than the original selling price. And apparently, Nike is not mad at this hustle because it believes “it helps build buzz and adds to the brand’s overall street cred,” a CNN report explained. It’s a dynamic, complex business that gives enterprising sneakerheads one hell of a return on their investment: “The more dedicated resellers have developed connections with wholesalers. The markups on them can be as much as 100 percent, or more,” the CNN report continued. Fashion is an opportunity to live one’s truth; buying kicks at retail price is an opportunity to save money and, for the business-minded sneakerhead, an opportunity to make money. Case closed. In closing: Let’s not get into those same boring conversations about what people who stand in those long lines for J’s—or any other sneaker—should and could be doing with their time, interests and money. Fashion is an opportunity to live one’s truth; buying kicks at retail price is an opportunity to save money and, for the business-minded sneakerhead, an opportunity to make money. Case closed.